My first stop today was the beautifully peaceful and remote Raven's Rock Gorge on the A839 outside Lairg. I pulled in here to have some lunch, but soon decided to stay a while and explore the woods. 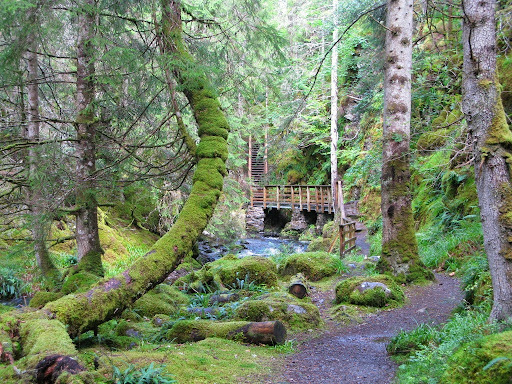 It turned out to be a reasonably short, but enchanting walk through ancient forest, by way of a gorge following a river, twisting and turning deep into the rock. 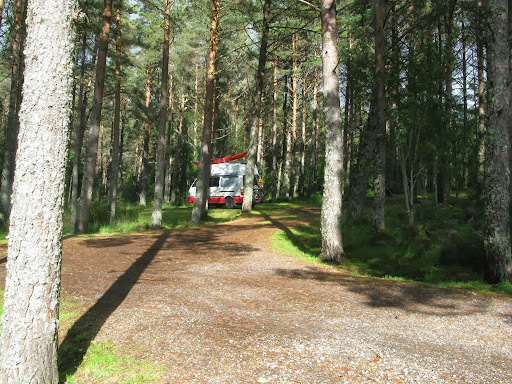 After a tranquil walk I had a little to eat and then drove on a few miles more to Rosehall. I saw a sign reading 'Rosehall trails' and swung into the carpark. In this part of the country there are rarely very many cars parked, and usually not even many places to park as its so far north, beyond the usual tourist routes. Right beside where I parked I saw the famous last words, 'MTB trail, 7 miles, allow 1 hour' so I thought, why not? I was feeling ready for a bit more exertion than the earlier walk had offered, so I unfastened the bike from its rack. I grabbed my raincoat and camera, then started up the track, dropping into a low gear. The weather was looking like it might hold, and the forest air was fresh, with a strong smell of pines on each deep breath. It was called the Sika trail, after a species of Japanese deer that had been introduced here a few generations ago when this land was a deer park. Some of them had escaped and they are still roaming wild to this day. I soon realised that not only were the views across the valley incredible, but the track was heading right up into the wind farm on the ridge. As you may have already worked out, I'm a fan of wind power and enjoy getting up close to the huge turbines. Green energy in what was once a miniature Christmas tree plantation - only kidding! It was an amazing cycle trail. Climbing up and up through the forest, then out beyond the treetops and into the heart of a 34Mw wind farm. 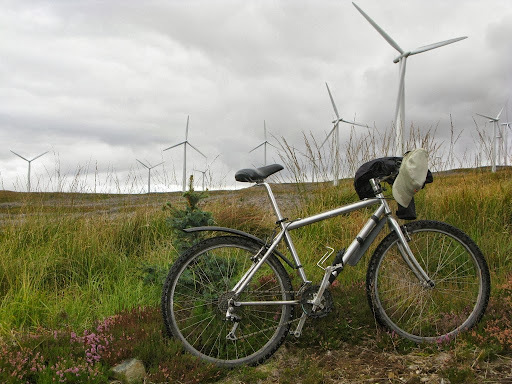 I was able to bike right up to the foot of the turbines, and gaze up at the massive blades turning powerfully, then looking across the farm of nineteen windmills to the mountain scenery on the horizon. Being up among these machines is how I imagine it may be to visit a NASA rocket launch site, they are truly enormous, all white and tubular with aluminium ladders and big submarine doors, everywhere signposted with numbers as they all look the same. It's a very hypnotic, place to be too as the huge blades turn slowly and the sound is quiet but natural, like waves on the shoreline. Every so often one hears the motors making minor adjustments to the angle of the rotors. The journey down was great. 4 1/2 miles of downhill, first 1 mile on the wide gravel track belonging to the wind farm, then 3 miles back on the main road. All of it downhill. Taking it at a leisurely pace, streaming with the pine breeze. 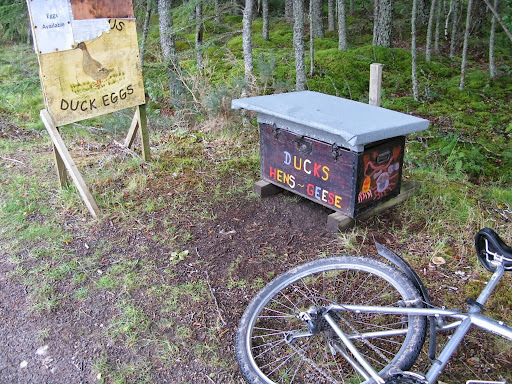 Passing back through the village I stopped and picked up some duck eggs for breakfast..